Start your engines and blaze into action with a premier mini movie event! 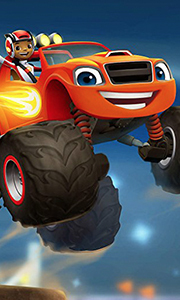 Join the fastest Monster Machine in Axle City, Blaze, and his driver AJ as they meet new friends, overcome Crusher's dirty tricks and use speed, stunts, and science to save the day! Ready? Then let's Blaaaaaaaaze! Blaze Of Glory: Join Blaze and AJ as they discover Axle City, meet new friends, put a stop to Crusher's schemes and Blaze into glory in the Monster Dome..
Own Blaze And The Monster Machines - Christmas DVD from Deff, DVD, Blu-Ray & 4K Video Specialists - Free UK Delivery..
Own Blaze And The Monster Machines - Dino Parade DVD from Deff, DVD, Blu-Ray & 4K Video Specialists - Free UK Delivery..
Get fired up for 4 action-packed episodes! From putting out a burning bridge or a burning hot dog cart, there’s no emergency too big or too small for Fire Truck Blaze! Help him race to the rescue on two Blazing adventures… plus save the truck wash and speed through the frozen wilderness too. Includes: Fired Up!, Five Alarm Blaze, Trouble At The Truck Wash, Sneezing Cold..
Own Blaze And The Monster Machines - Light Riders DVD from Deff, DVD, Blu-Ray & 4K Video Specialists - Free UK Delivery..
Own Blaze And The Monster Machines - Race Into Velocityville DVD from Deff, DVD, Blu-Ray & 4K Video Specialists - Free UK Delivery..
Own Blaze And The Monster Machines - Race To The Top Of The World DVD from Deff, DVD, Blu-Ray & 4K Video Specialists - Free UK Delivery..
Own Blaze And The Monster Machines - Ready Go Collection DVD from Deff, DVD, Blu-Ray & 4K Video Specialists - Free UK Delivery..